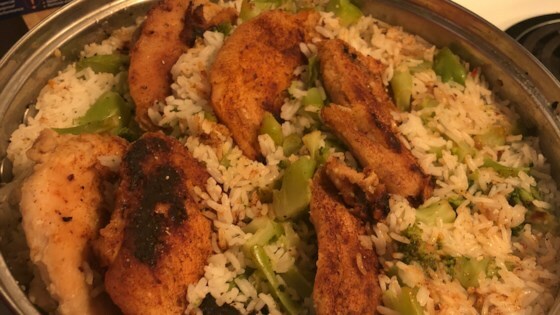 "Golden sauteed chicken breasts simmer with Swanson® Chicken Stock, garlic, mixed vegetables and rice to make a delicious skillet dish that is finished with grated Parmesan cheese and a sprinkle of paprika." Spray a 12-inch skillet with the cooking spray and heat over medium-high heat for 1 minute. Add the chicken and garlic and cook for 10 minutes or until the chicken is well browned on both sides. Remove the chicken from the skillet. Stir the stock, rice and vegetables in the skillet and heat to a boil. Reduce the heat to low. Cover and cook for 15 minutes. Stir in the cheese. Return the chicken to the skillet. Sprinkle the chicken with the paprika. Cover and cook for 10 minutes or until the chicken is cooked through and the rice is tender. The rice and veggies part was great. The chicken turned out dry. If I made this again I would boil the chicken in the broth. I made this with fresh veggies. Not a bad recipe at all, it was actually very easy. I substitued brown rice for the white rice. It took much longer for the rice to cook through, but once it was ready, it was really good.